I phoned Fatimeh yesterday and mentioned that her spring holidays from ESL school would begin on Good Friday. She remarked excitedly, "It's a good luck Friday." "No, Fatimeh," I replied. "It is not about good luck but rather it is the day we remember Jesus died on the cross for our sins, then was buried in a grave and came alive again on Easter day." The reaction to the cross was essentially one of ignorance and then surprise. Khalid, a prominent religious leader in his community, was a very sick man. He was drifting in and out of consciousness when I arrived in his hospital room. His distressed wife, Fardos, had called me saying that “it is serious”. I wanted to pray for him but I wondered if it would be possible because I was sure many from their Arab Muslim community would be present during visiting hours in his hospital room making prayer awkward. But, lo and behold, I was alone! He did not seem very aware of his surroundings but when he saw me, something strong within him rose up and he ordered, “Take that cross off the wall.” A hospital orderly in the room feeling nervous about removing the crucifix took the calendar hanging close by and hung it over the cross. That bothered me a lot. I asked Khalid if I could pray for him. He nodded yes. As I prayed for him his whole body shook like a leaf. Then I left. A crucifix could be covered up but no one could remove the presence of the Living Christ from Khalid’s room. Later his wife called me and asked, “Did you visit Khalid?” She didn’t explain why but she was sure it must have been me. I was amazed that the sight of a crucifix on the wall would elicit such strong negative emotion in the dying Muslim man. Or was it more? We invited a Saudi man to our home for supper. Across the street from our home is a large church which has a cross raised high for all to see from a distance and is illumined at night. It is a special blessing to me reminding me day and night of the wonderful Savior we have who poured out His blood for the forgiveness of our sins at great personal cost. We pointed out the cross to our Saudi friend. He literally shrunk back gazing at it from our back door. He listened carefully as we explained the story. The cross seemed to elicit fear to our Saudi friend. One day, in the middle of the week, I decided to take Karima to the church. She had never been inside a church before. We sat in the quiet empty sanctuary staring at the cross on the wall when she became overcome with some inexplicable emotion. She asked if she could pray. She prayed out loud a long time in her language from her heart. Then I prayed. Karima began to cry and continued to do so for quite some time. The Spirit was drawing her but she was resisting declaring she was a follower of Jesus. She was in the valley of decision. As we gazed at the cross on the wall I went over the story again. She was overcome with a magnetic attraction. A few years later she gave her heart to Jesus. Salima has given her heart to Jesus and is not ashamed of the cross. She wears a necklace with a cross proudly declaring she is a passionate follower of Jesus. Muslims can be ignorant about the cross or enraged, fearful, or attracted to the cross. I love to tell them the story. Those who understand and give their hearts to Jesus declare proudly their love for their Savior. There will usually be one of those reactions. If there is no reaction it has not been understood. Do not let a negative reaction stop you from sharing the story of the cross. Dear heavenly Father, I’ll never stop being amazed at the story of the cross. In Jesus’ name, Amen. Don’t get angry with Muslims or it will disqualify you from ministry in the eyes of the Muslims around you. I believe that was some of the best advice I have received in my missionary career. Many things can arouse either righteous or unrighteous anger in us. We can feel anger about spiritual blindness, certain undesirable cultural customs, feeling used, inequality shown towards females, lying, or control over a person's soul, mind, and body. Many Christian women in ministry can feel anger towards Muslim men. Maybe we feel anger because we think we are wasting precious time in a ministry that does not appear fruitful. The trigger arousing anger in us may be big or small. Anger can build up in us over time in Muslim ministry. We need to know how to identify and handle both righteous and unrighteous anger. I wish I could say I have never displayed anger before my Muslim friends. Recently I felt like a failure. I blew it. A visit was arranged for 4 p.m. with a Muslim family. Suddenly at 1 p.m. Afsana called me and asked if we could come over right away because their Muslim friends had just invited them over and they would have to leave at 3:30 p.m. I was upset. Her community took precedence and I felt rejected and offended. I didn’t say any angry words over the phone but I felt anger well up in me. I hoped she did not detect it. Another time a tea visit was arranged with another Muslim family. Naheed called and explained that her husband was not feeling well so they could not come. I was disappointed but not angry. Anger came later when I discovered from someone else that there was a community picnic which Naheed and her husband suddenly were invited to. It has happened a number of times that after a visit has been arranged and agreed upon that something arises in their Muslim communities which breaks up the plan. The desire or obligation to be with their own community first pulls hard at them. Sometimes I have gotten angry – or at least felt it. Other times the look on my face has been interpreted as being angry. Believe me, we are watched carefully! Whatever it has been, the aftermath relational waves have brought forth sad results. Maybe this has happened to you, too. It keeps me on my knees asking God for cleansing and for wisdom and self-control. There is no question that the detection of anger in us towards our Muslim friends can get magnified and friendships broken off. But most of all our witness about Jesus may be jeopardized. It is an awful feeling when a sense of failure and guilt engulfs us. Satan loves to get us into that state of mind. On the positive side I can say that these kinds of situations have created a deeper reliance upon the Holy Spirit and humbled me. Growth in self control and humility are never wasted. Our failures are not the end of God using us. He is merciful. When we are repentant He is faithful to cleanse us. And we keep going with our eyes upon Jesus. Dear heavenly Father, please help me to display Your holiness before my Muslim friends. In Jesus’ name, Amen. God loves Muslim women and so do I. 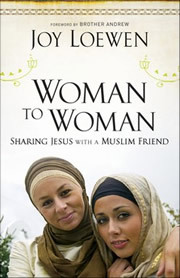 It is my desire to help equip Christian women to engage effectively with Muslim women with the love and truth of Jesus Christ. If you are already reaching out, you are not alone. There are many of us meeting Muslim women and developing beautiful friendships with them. For security reasons most names are pseudonyms. If you have a question about Muslim evangelism, I am offering a venue where you can ask...please Contact Me. Welcome to any Muslim woman reading this, too. You will find it is not my intention to attack either your holy book or prophet.